Here’s one method that has worked well for me. 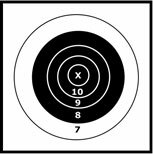 I take the load that I plan to shoot at an upcoming Long Range match to my local rifle range and determine my sight settings for 100 yards. Once that number has been determined, I simply add 105 minutes of elevation to arrive at my preliminary 800 yard setting (i.e. 100 yard setting is 33 / add 105 minutes = 138). Then, by adding 25 minutes to the 800 yard setting, I arrive at a 900 yard setting (138 + 25 = 163). Adding another 25 minutes to my 900 yard setting brings me to my 1,000 yard setting (163 + 25 = 188). For your information, I shoot a Browning Creedmore .45-90 with a Paul Jones Creedmoor Long Range 543 grain bullet propelled by 90 grains of Swiss 1 1/2 powder at about 1,300 feet per second. Although this method probably will not be the exact setting that you need, it should get you close. Final adjustments can be made during the “2-Minute Sighting Period” prior to the start of your relay (if one is allowed) and during the first few shots you take at the beginning of your official “Course of Fire”. This is when you can “dial-in” the exact settings that you want. During this period, you’re firing at your actual target and should have a better idea where your rounds are hitting. Another way to get preliminary sight settings is to find another shooter at the match who is shooting the same caliber, and the same basic bullet and cartridge configuration that you are using. Tell them that you have never shot at Long Range before and ask them if they would be kind enough to share with you what their sight settings are for the three distances. Most shooters will be happy to help you.